I am not musically inclined AT all. I’m not all that hot at anything that requires coordination, for the matter. I’m a runner, remember? I mean, I played the trombone and flute for 3 years in middle school, but that doesn’t count. 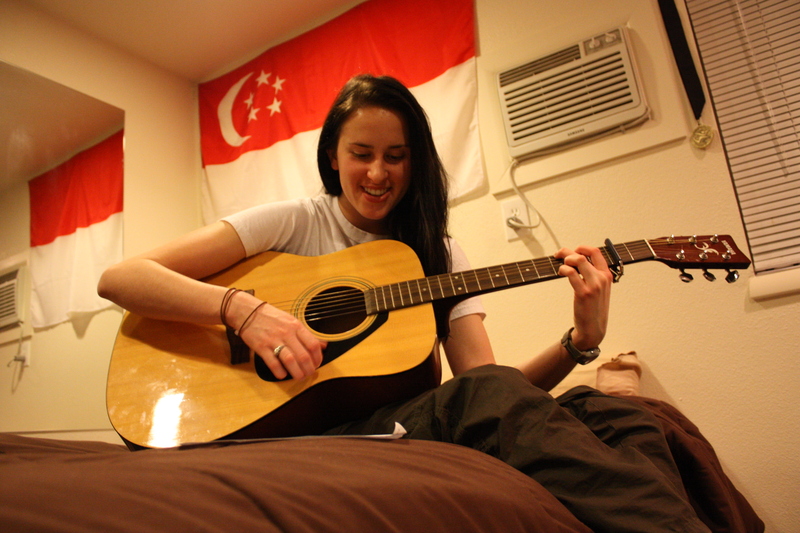 Weez owns an acoustic guitar and has been playing for years. I don’t know what it is about a handsome guy singing and playing guitar, but it’s deadly. He’s got a great voice too, so it’s like a double wammy. 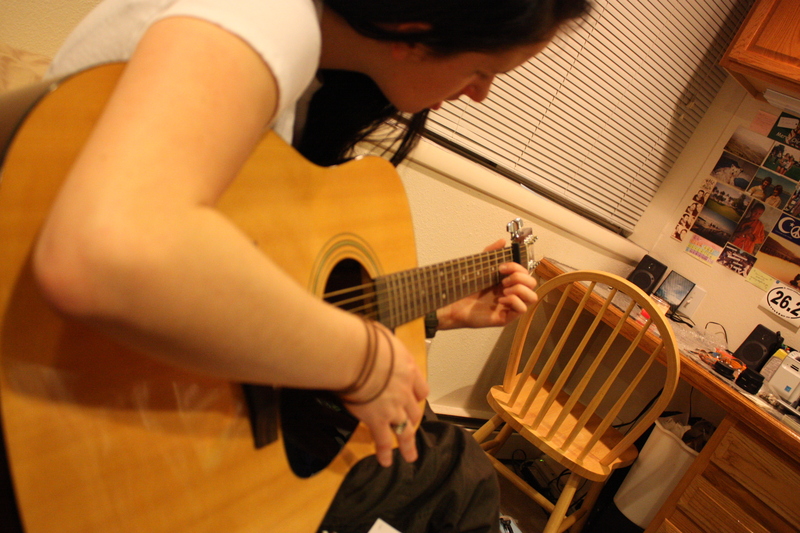 One of my 24 goals is to learn how to play a song on the guitar. I thought long and hard over break as to what song I’d like to try and tackle and I finally decided. Wagon Wheel, by Old Crow Medicine Show. This song is perfect for me. 1. It’s a classic – lots of people know at least the chorus, so people could sing along if I were to ever play around the camp fire. 2. The chords are beginner levels of simple. 3. This song has significant meaning to me and some of my friends out here. I’d be proud to learn how to play this song, for Wade. So last night, after Project Runway with my girls, Weez came over with his guitar and he started to teach me how to play each of the chords. Let me just tell you, G is the most awkward chord to play but it sounds like heaven when you hit it just right. Surprisingly, it didn’t take too long to memorize all the different chords and their finger positions. 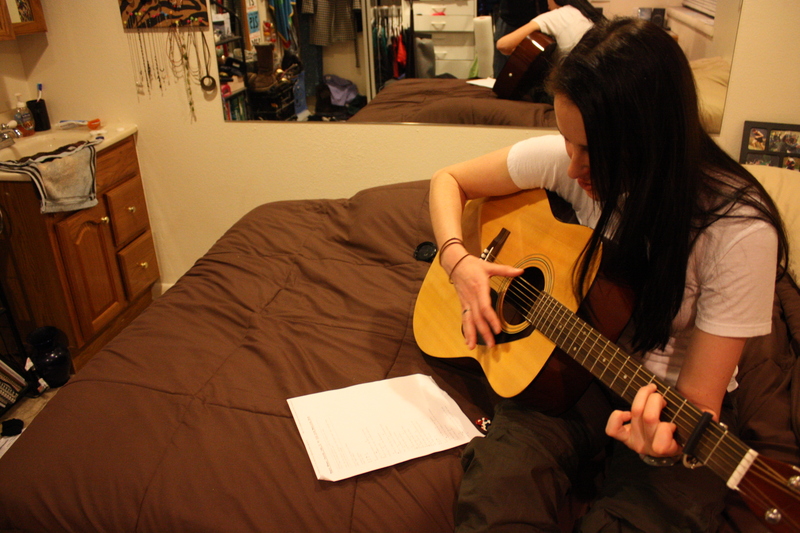 Then I was on to putting the chords to the song. The hardest part will be making smooth, quick transitions between each chord.